U.S. Immigration and Customs Enforcement's Karnes County Residential Center facility for mothers and children apprehended at the border, in Karnes City in 2014. Here to help us take one last look at the week in Texas politics before the new year is Guadalupe Correa-Cabrera, border security expert and political science professor at George Mason University. It’s a very important issue that closes the year. 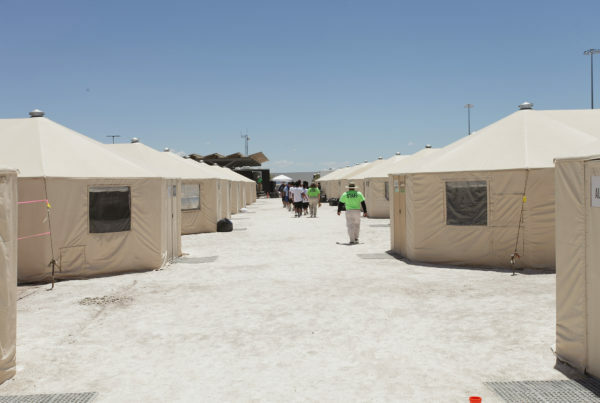 … Some people are very critical about the conditions at the detention centers and they’re blaming the Department of Homeland Security. Secretary [Kirsjen] Nielsen has explained [to] us that the conditions of these two minors were very complex even before they arrived, and she talks about the dangerous journey and the problems that these migrants experience along the migration route. What I expect is that [Democrats] are not going to provide any money for the construction of Trump’s wall. But … the future of the nation is centered, for the first time, on the border. It’s nothing new. That has been the practice, but the coverage is different because this is now an issue that everybody is ready to look at. Listen to the rest of the story in the audio player above.